It is Saturday night. You are on a high. You are on top of the world. That is how you are feeling right now. A high is ecstatic and overwhelming. What to do with all those emotions and happiness? You can contain the feeling to conserve it, or you can express it immediately and shout out loud what great person you are. The later might be true for you. I don’t doubt it. I’m convinced every person on the planet is great (in their inner core, only some like to show their ugly side too often too much). 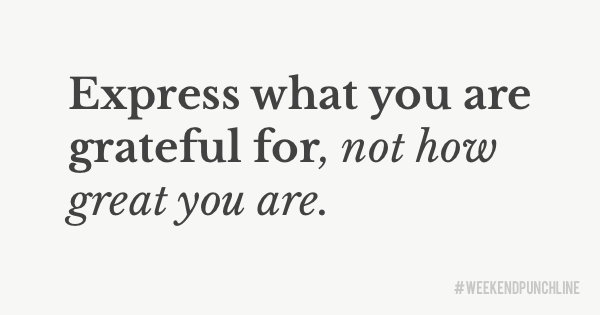 Try to express-conserve your high by being grateful. You are still expressing it, by saying „I’m grateful for being a great person“ instead of „I’m a great person“. Do you see the difference? The conservation happens because you put the celebration of your win into a humble perspective only by prefixing your sentence with „I am grateful for…“. Meaning it [the gratitude] would be great as well. Conserving is important because when you say something out loud out it takes energy off of you and you consume the words. A consumed word has a low energy because it’s now out. A words has the highest energy, the highest peak, the millisecond you said it out loud and your listener received it. When you express through gratitude you conserve this energy and keep the energy for yourself, for your own action after. Your expressed word keeps its energy level only because you said how grateful you are about your (high) feeling. That’s why words or conversations can lower your energy level so much (for the receiver and sender). Words can hurt, words can empower. Words can break, words can make (you a better person). If you consider words and expressing yourself (speaking out loud) a release and distribution of energy towards your listener or the air, you understood what I’m talking about. A more radical approach towards dealing with expressing success is the rapid win gesture (a clenched fist) followed by one second of pride that you store into your memory. After, you immediately tell yourelf „I’m grateful I had this win“ to continue with the „I accomplished nothing“ mindset. You appreciate your win but you are not overdoing it. Personally, I overdid it in the past, so I learned that a win is a snapshot. A win is the blink of an eye, a sprint. Nothing that lasts. This was episode 7 of the #weekendpunchline . Every Saturday and Sunday.